12-day trip for two to the treasures of Machu Picchu, Cuzco, and the Peruvian Amazon. The dusty road from Marrakech to the Dades Valley delivers travelers from Morocco's medieval capital (home to one of the world's largest Berber markets) to the red-rock strata of the Anti Atlas Mountains. "The landscape is extraordinarily beautiful. You can drive miles across the stony desert without bumping into anyone, and the magnificent red-colored sand hills shimmer in the sunlight," explains Jozef De Fraine, a banker who lives near Brussels. 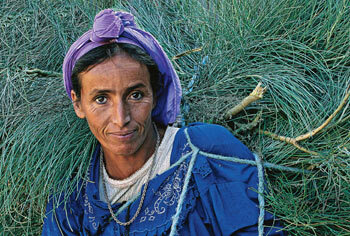 "The Berber people are extremely welcoming, but they frequently resist being photographed. However, a friendly attitude on my partand hand gestures, since I don't speak Arabichelped open doors. I was busily taking another picture when this beautiful woman approached me, her face encircled by the pine branches. I asked permission to photograph her. I try not to take portraits in the bright sunshine because the light is too harsh, but in this case a natural shadow helped make an image full of saturated color." Every year De Fraine takes an international photo trip with two friends; these shutterbugs are part of the Iris Lede photo club, headed up by merit prize winner Jozef Reynaert. "Spending a few weeks a year doing nothing but my hobby is sublime," explains De Fraine. "It was especially nice in Morocco's vast, empty desert. I hope to visit more deserts soon. My dream desert? Namibia's." (Canon 10-D, Canon 100-400mm lens, digital image.) Prize courtesy of National Geographic Expeditions and National Geographic Traveler.